You are here: Home / 2019 / March / 20 / Is It Just Too Dangerous To Cycle In Brighton? At the time of writing, the UK is basking in unseasonably warm sunshine. Spring appears to have arrived early and with it, many of the outdoor activities that one associates with more temperate weather are making an early appearance. Whilst cycling is an all year-round activity and indeed a necessity for those who use it as their main method of getting around our towns and cities to commute to and from work, the number of people who choose to jump on their bikes increases considerably in the spring and summer months. The Visit Brighton website rightly highlights the pleasures of cycling along Brighton’s coastal routes: out towards the Marina, along the stunning cliff paths of Saltdean and Peacehaven, the coastal route from Shoreham to Rottingdean and the combination of coast and countryside that can be experienced by cycling the Seafront to Downs Route. However, cyclists who travel daily on the city centre roads would most likely give a wry smile at the suggestion that Brighton is some kind of cycling paradise. 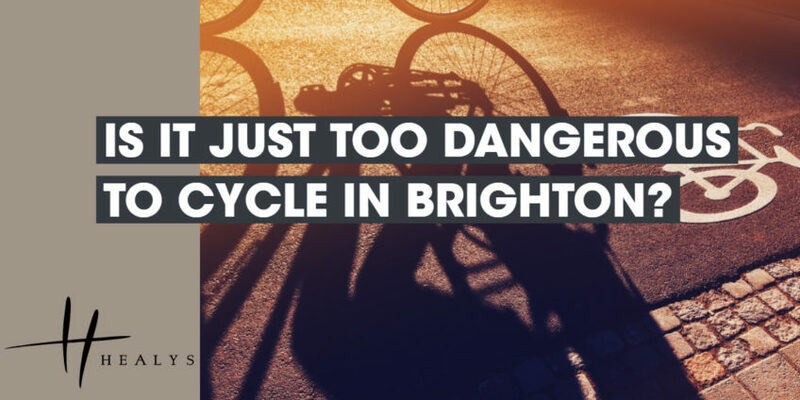 It will doubtless come as a surprise to those not familiar with the city that Brighton is consistently ranked as one of the most dangerous cycling cities in England. It was reported that in a year when Brighton actually ranked as the most dangerous of ALL cities (including London) in the UK for cyclists, 157 cyclists were killed or seriously injured on the city’s roads. Poor road design and busy junctions are undoubtedly contributory factors. However, as most cyclists are injured as a result of collisions with other road users and most commonly with other motorised road users (car, vans, lorries, buses and motorcyclists), Brighton’s appearance in another ‘top 10 most…’ list provides the biggest clue as to where the problem for Brighton’s cyclists really lies. In 2018, a government backed study by The National Infrastructure Commission listed the top 10 most traffic-clogged cities in the UK outside London. Coming 8th in a list which comprised in the main large major cities such as Manchester, Liverpool, Leeds, Nottingham, Birmingham and Bristol, was Brighton. The report was based on comparing the ease with which people could drive from one area to another during peak and off-peak times. Places with the largest variation in travel times during peak and off-peak hours were rated as being most congested. In a nutshell there are just too many vehicles on the roads of Brighton and the infrastructure cannot cope with the volume. Along with pedestrians, cyclists are the most vulnerable of road users. The problem for cyclists is that they actually have to share the carriageway with motor vehicles. The potential for the two modes of transport coming into collision with each other in large volumes of traffic, is pretty high. In almost all circumstances where the two collide, the cyclist is going to come off worse, for obvious reasons. In collisions involving a bicycle and another vehicle, the most common key contributory factor that the police record, is ‘failed to look properly’ by either the driver or rider, especially at junctions. ‘Failed to look properly’ was attributed to the car driver in 57% of serious collisions and to the cyclist in 43% of serious collisions, at road junctions. When the volume of traffic is heavy, it is particularly easy for a motor vehicle driver to miss the approach of a cyclist on either the near or offside of his vehicle. Cars and vans changing lanes in heavy traffic, is a serious problem for cyclists, particularly if they are able to ride past stationary vehicles which suddenly start moving again. HGVs present a serious danger to cyclists, most notably in heavy traffic where the cyclist is able to make progress on the road whilst other vehicles are stopping and starting. These types of accident often occur when an HGV is turning left at a junction and fails to see the cyclist on his nearside. According to the RoSPA report, about one quarter of all serious accidents involving serious injury to a cyclist were caused by an HGV, coach or bus driver travelling too close to the cyclist. That having been said, by no means all accidents involving cyclists and other road users are the fault of ‘other road users.’ Motorists become incensed at cyclists who drive off the pavement onto the road and those who ignore red traffic lights. Why does Brighton suffer in comparison to, say, Cambridge in terms of providing a safe environment for cyclists? The national average proportion of people cycling just once a week is 12%, but in Brighton the percentage is higher at 17%. Compare this with Cambridge where almost half the adult population cycles at least once a week. Cambridge is considered to be the most popular place in the country to cycle. What is Cambridge doing that Brighton isn’t, for its cycling population? It restricts the number of parking permits it issues – the choice of transport may be between no wheels and two wheels for a lot of people! Business incentives are given to provide bike hire and parking spots for cyclists in the city. The authorities in Brighton have responded to its poor reputation as being anything but a safe haven for cyclists by increasing the number of cycle lanes. Improvements are being made along the Lewes Road and Old Shoreham Road. There are already cycle lanes across the city, including along the seafront, Grand Avenue and The Drive, and Hove to Hangleton. New cycle parking has been installed in the city. How far Brighton is able to move forwards in its efforts to appreciably improve life on the roads for the city’s cyclists, remains to be seen. Perhaps more ‘park and ride’ schemes may be brought in in the future to assist a reduction in the number of vehicles in the city? As always, the question of financing such schemes and the public transport improvements required to accompany them, will be an issue, as will the potential effects such measures would have on business in the city. However, if Brighton as a city wants to ensure that the numbers of those injured in cycling accidents within its city limits are reduced year on year, it must keep up all possible efforts to ensure that it does not stand still in its attempts to make its roads safer for all road users. One negative and an ongoing problem now for many years, is the fact that Brighton seems to have been taken over by roadworks. They are everywhere and as the majority of residents we suspect would agree, they never seem to finish. This is likely to be a problem that does not go away in the near future and that is a worry. Traffic congestion invariably leads to a less safe environment for cyclists. That cannot be good news. Healys personal injury solicitors based at their Brighton office, have acted on behalf of many cyclists who have suffered injuries as a result of cycling accidents and have recovered many thousands of pounds worth of compensation as a result of bringing cycling accident compensation claims, on their behalf. If you have been injured in a cycling accident and wish to discuss making a road traffic accident claim, contact us on 0800 280 0432 or if you want us to call you back, please complete our enquiry form online.